The 2018 race season kicks off Saturday night February 24 at 7pm with a ton of talent all with hopes of becoming the series champions. Reigning champs Don Earven, Ray Czumaj, Steve Soboski and Bret Bierman all return as the drivers to beat in the championship series. 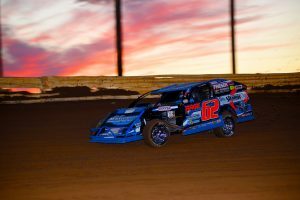 Along with IMCA Modifieds, Sport Mods, Pure Stocks and Robert Horne Ford Bombers the Modlites and Lady Stocks also bring in the new season Saturday night at Arizona Speedway. Action begins at 7:00pm Saturday at Arizona Speedway with grandstands opening at 5:00pm both evenings and pits opening at 4:00pm both evenings. Cost for admission just $15 for all adults, kids 11 and under are free. Pit passes $30 , kids 7-11 pit passes $15 and kids 6 and under free. Arizona Speedway is located within ET Motopark at 48700 N Ironwood Dr. San Tan Valley, AZ 85140 5 miles south of US60 on Ironwood dr. Call the hotline for more info. 480-926-6688 . Follow us at www.Facebook.com/ArizonaSpeedway .